Freebie afternoon commuter newspaper MX finishes its run today after 14 years of publishing in Melbourne (and shorter runs in Brisbane and Sydney). Melbourne Express was its awkward morning competitor for a short time in 2001 — it was never going to last because morning distribution is so difficult. That brand name lives on in The Age’s morning updates. 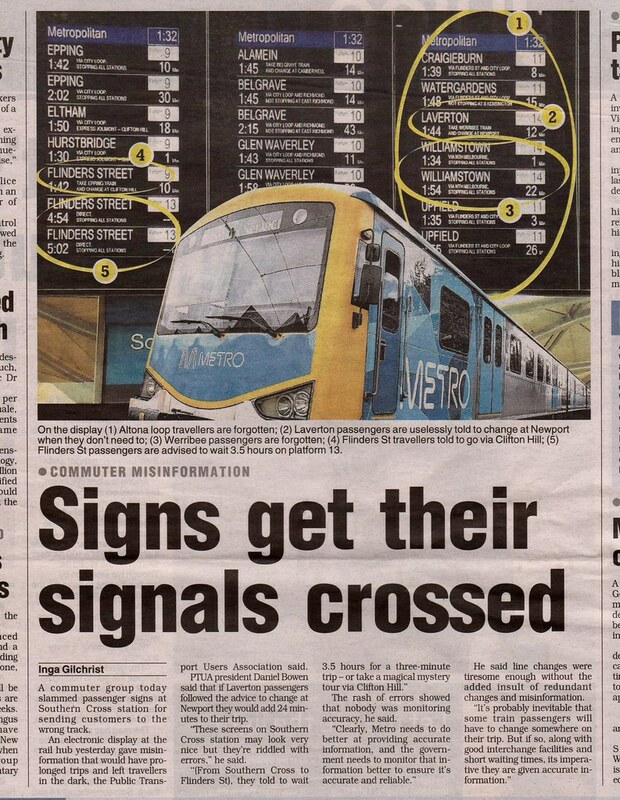 Some may mock MX for being overly filled with show-biz news and lifestyle stories, but for years it had a good team of local reporters, and their focus on public transport-using readers meant they always gave the PTUA a good run, often on the front page. It was a great way to reach a key demographic… for advertisers too, of course. 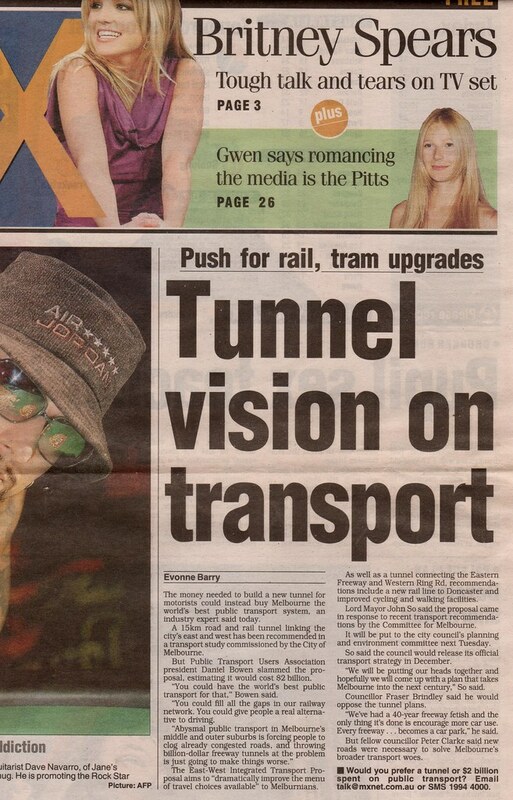 30/8/2005: East-west tunnel? Or public transport? It’s a debate that’s been around for a while. Alas, their coverage of local news changed somewhat earlier this year when MX had a revamp. Recently there’s been little local content in it; indeed it appears much of the paper has been a generic Sydney/Melbourne/Brisbane production. MX of course had other uses. Some would get it every day just for the crosswords. You could wave it angrily at cars that failed to stop at zebra crossings. You could use it to cover that horrible-looking stuff on the train seat. Perhaps with the recent proliferation of smart phones (iPhones were still six years away when MX launched) it’s not surprising it’s wrapping up. It’s hard to break news if you go to press at midday for distribution to people at 4-5pm when many of your readers will have seen the same stories at lunchtime on their phones and computers. 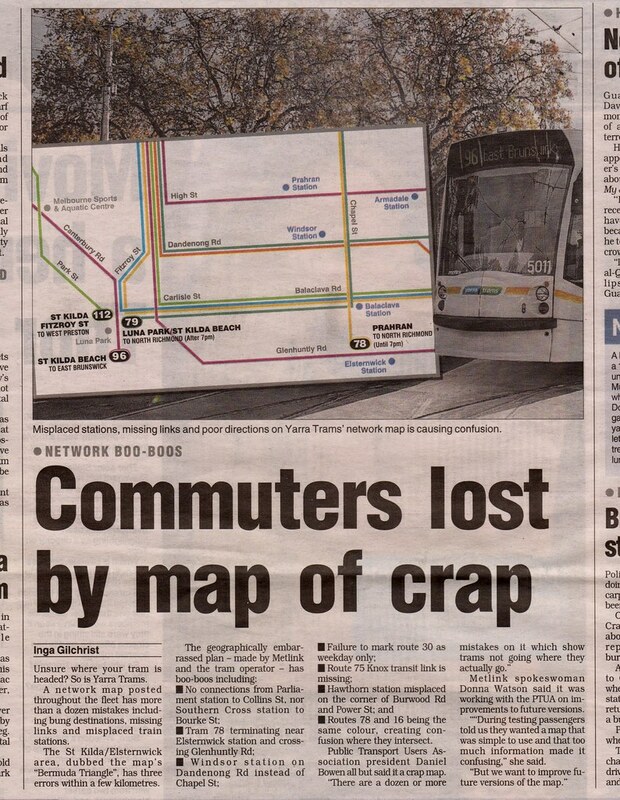 Notably, News Corporation has been advertising news.com.au heavily around public transport recently. So long MX, it’s been nice knowing you. And to all the journos there I dealt with over the years, past and present: Erin, Hanna, Inga, Lachlan, Maria, Michelle, Nadia, Rebecca and any I might have forgotten (and/or not saved in my phone!) — thank you and good luck! Did Mx only employ ONE male journalist? @Roger, there were other journalists there (such as on sport and entertainment) that I never spoke to. Plus I think I’ve missed some in my list who went on to other organisations thus I updated their entries in my phone at some stage. Good riddance. I stopped reading MX a while back because of its support of immorality including favouring the more smutty news stories. It didn’t deserve to survive. I would much prefer a printed version. While I understand it will never be as popular as it was, due to the smart phone and other devices, I am confident that once novelty has worn off, as it already has with me, the paper just may pick up again. I have bucked the trend somewhat in that I shall never buy a mobile phone of any kind, and shall never buy something that would use or require the use of mobile phone communication such as MobileNet. On the other side, I do have two mini-tablet devices which do have access to wi-fi. One being an E-book reader, the other is an android device. The novelty has somewhat worn off, and I will often not bother taking them with me. — The Kobo does have a news & Magazines feature, but I have not yet found of one publication that I can buy for it. — As for the Android device, it aint worth the time most of the time. I often regret getting it. — It is such a slow device, just to get in and get to where you want. You need to wait for it to start up, then you need to get into a wifi connection, and often that is not enough to get you loged on, then you need to find the app or the website you need, then wait for that to load. Then, you need to make sure the battery does not go flat. — The battery, which needs a USB port to charge up. Despite having a stack of batteries for my camera, I could do nothing to continu using the flat tablet any more. I cant just enter an electronics store and buy some replacement batteries. I have seen those vending machines, but have not tried them yet. — Then you have download limits such as with Westfield which have a 50mb per day limit, how often I needed to re-log on at various other wifi hotspots, including Hungry Jacks in Ballarat a few weeks ago. — The most hated websites in how slow they are to download, are the newspaper sites. They do not tell you to wait while it downloads. That is on a desktop PC with broadband. There is nothing like just picking up a newspaper, it does not go flat after so much use, you just pick it up where you find it, where it is not free, you just hand over a $2 coin and off you go. SmartPhones, like all forms of new technology, shall always have that fab with a lot of people until the fun wears off. While you will always have people who will stay with the new way, I wonder how many people would in a few years to come, would want the paper to come back? I dream for the day when I can use my E-Device, tap it on the desk at a newsagent, hand over a $2 coin there, and have an electronic one downloaded there and then.